Where do Mules Come From and Are Mules Native to America? 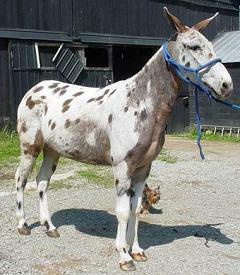 Mules are not native to America. The mule made it from Europe to America because George Washington developed an interest in the animal. He had heard that farms throughout Spain were using an amazing work animal that was stronger and more surefooted than either the horse or the donkey. Best of all, it ate less, too. He asked the U.S. ambassador to Spain to inquire further about the animal, the infertile offspring of a jackass and a horse mare, and in 1785 King Charles III of Spain sent Washington a male donkey as a gift. Washington appropriately named him “Royal Gift.” He was soon so impressed with the abilities of the mule that he began devoting time to its breeding. By the time Washington died fifteen years later, there were fifty-eight working mules on his Mount Vernon plantation, and other farmers throughout the region began siring their own mules from Washington’s stock. The mule remained America’s favorite plow animal until modern-day tractors were invented in the 20th century. How many Native Americans live in the United States and is the Native American population growing?